SupportLine provides a confidential telephone helpline offering emotional support to any individual on any issue. The Helpline is primarily a preventative service and aims to support people before they reach the point of crisis. We offer support to children, young adults and adults by telephone, email and post. We work with callers to develop healthy, positive coping strategies, an inner feeling of strength and increased self esteem to encourage healing, recovery and moving forward with life. 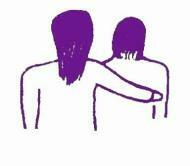 We also keep details of counsellors, agencies and support groups throughout the UK.